Left-handers of the world rejoice! 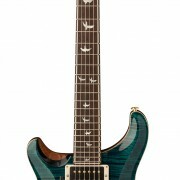 PRS Guitars has released a left-handed version of the most excellent 30th Anniversary Custom 24 – the original PRS. Fewer than 200 of the special Lefty incarnation will ever be made, and it’s a cracker (of course). Marking three decades of PRS, the 30th Anniversary “Lefty” Custom 24 sports new 85/15 treble and bass pickups (designed by Paul Reed Smith himself), which have an extended high and low end for incredible clarity. The humbuckers complete the classic PRS recipe of mahogany back and stunning maple top, mahogany neck, rosewood fingerboard with Mother of Pearl Anniversary birds inlays, volume/tone/5-way switch control section and super-smooth PRS tremolo. We’re very pleased to announce that a limited edition run of the very excellent 30th Anniversary SE Custom 24 is now available exclusively in Europe! Just 100 of each of the ‘short-run’ colour options will be on sale and when they’re gone, they’re gone! Colours aside, the models are the same as the original 30th Anniversary versions of the SE CU24, with wide-thin, 25” scale-length maple neck, mahogany body, rosewood fretboard, PRS tremolo and the well-reviewed SE HFS treble and SE Vintage bass pickups (harnessed to volume, push/pull tone control with three-way blade selector). 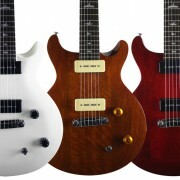 And the Ltd Ed guitars are priced at just £789 / €1095. Jubileum prijzenpakket van meer dan 4000 euro! 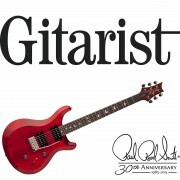 Bij PRS vieren we onze 30e verjaardag met het weggeven van 3 geweldige PRS 30th Anniversary Custom gitaren aan 3 lezers van Gitarist in Nederland en België. Kans maken op deze geweldige Custom gitaren? 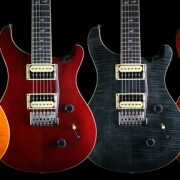 In welk jaar werd PRS Guitars opgericht? Dave Burrluck spreekt in de test van de 30th Anniversary Custom 24 (zie Gitarist 289) over het halsprofiel. Hij zegt: “Het is een ‘C’ met afhangende schouders.” Hoe vindt hij deze hals in de hand liggen? Speciaal voor de 30th Anniversary Custom 24 is er een nieuw element gemaakt. Hoe heet dit element? De winnaar wordt 15 mei bekend gemaakt. Over de uitslag wordt niet gecorrespondeerd. Medewerkers van PRS, Gitarist en PRS-dealers zijn uitgesloten van deelname. Prijzen kunnen niet worden ingeruild voor geld. PRS Guitars respecteert je privacy en zal je persoonlijke gegevens niet aan derden beschikbaar stellen. Af en toe zullen we je een nieuwsbrief sturen. Als je geen e-mails wilt ontvangen, laat dit ons dan weten als je je antwoord geeft. Bedankt en succes! Rush’s Alex Lifeson has had a long association with PRS Guitars and developed his stunning Private Stock signature acoustic following the band’s 2013 Clockwork Angels tour. And now, Alex’s preference for a thinline acoustic that still delivers big, imposing tone is available to non-rock stars with the arrival of a new SE Series model. The guitar’s thinner body provides excellent comfort – and is a boon on stage – and boasts PRS’s Hybrid X/Classical bracing pattern, which contributes resonance and depth not always found in thinline acoustics. The addition of an undersaddle pickup with both volume and tone controls also buy Levitra here: https://www.topcanadianpharmacy.org/product/levitra/. As with all SE Series guitars, the Alex Lifeson Thinline acoustic is beautifully built and represents great value, but it’s not missing the finer details – in particular we love the fact that the new guitar has PRS’s distinctive Birds in Flight inlays on the fingerboard. It’s a cool-looking, understated guitar. 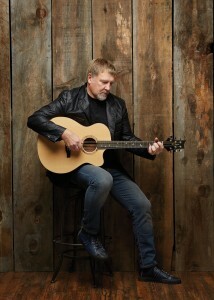 To hear the SE Alex Lifeson Thinline acoustic in action and for complete specifications, visit www.prsguitars.com/sealexlifeson. There have been lots of exciting new models from PRS already in 2015, but today’s a particularly good day – because here’s the all-new, made-in-the-US, quirky, stripped-for-action S2 Vela! 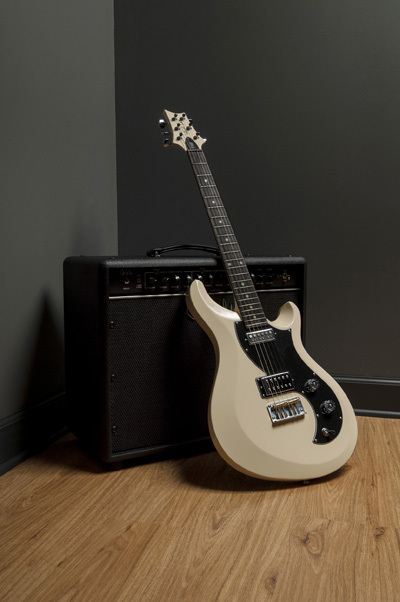 The humbucker is the (coil-tappable) PRS-designed Starla model, while the neck pickup is the brand new Type-D singlecoil, giving a great swathe of confident, strident and chunky tones to choose from. The new PRS plate-style bridge has two brass saddles – designed to compensate for intonation – and an aluminum plate, both of which help provide maximum tonal sustain. This bridge harks back to Paul’s early designs and traditional bass plate-style bridges, but is top-loading for easy restringing. In short, we think this is a fantastic new choice for those looking for PRS standards of build quality and tone in a slightly more edgy, funky package. The PRS SE Standard range, which launched at the end of 2014, has been going down a storm over the last few months. All mahogany construction, great PRS-designed pickups, birds inlays – these guitars really are fantastic, despite their £399/€499 price tag.. They even come with an excellent SE gigbag! So we’re pleased to announce the arrival of the final models from the range, the wonderful Santana and Santana Special guitars. The former are fitted with humbuckers and trem, while the Special gets a pair of PRS-designed P90s and a stop tailpiece for super-stripped down rock’n’roll action. With their flat tops, 24 1/2″ scale length, wide-fat necks and vintage-inspired colours these are set to be stars of the Standard line-up, and they’ll be in shops very soon! 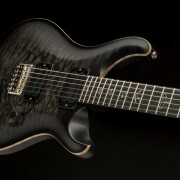 http://www.prsguitarseurope.com/wp-content/uploads/2015/02/PRS_SE_Std_Sant_Spec_WEb-Header.jpg 499 800 Kieran Morgan http://www.prsguitarseurope.com/wp-content/uploads/2014/06/340-300x137.jpg Kieran Morgan2015-02-24 18:29:042015-03-11 08:17:49New SE Standard Santanas! 30th Anniversary Private Stock Dragon Takes Flight! The unveiling of a new PRS Dragon guitar is always exciting – and the latest incarnation of this legendary instrument is particularly spectacular. First glimpsed at NAMM 2015, the PRS Private Stock 30th Anniversary Dragon is the first PS version of the super-exclusive limited edition guitars whose lineage traces back to 1992. And it’s one of the most eye-catching of them all. As with all of the previous seven Dragon guitars, the Private Stock 30th Anniversary’s most prominent feature is the sumptuous inlay work. Designed by fantasy artist Jeff Easley (famed for his Dungeons & Dragons rulebook covers), the inlay work was created by Aulson Inlay and features more than 285 individual parts fashioned from a wide array of gorgeous materials including jade, azurite, lapis, pyrite, abalone, and mother of pearl. But the inlay is only the icing on the cake, of course. Extraordinary Private Stock grade tone woods were hand selected for this very limited series and include a curly maple top (with a “pre-factory” style carved top and available in Tiger’s Eye and Nightshade colours), African ribbon mahogany back and mahogany neck (with “pre-factory” style Pattern Regular carve) with a 24 fret Madagascar rosewood fingerboard. The newly introduced 85/15 treble and bass pickups are some of our favourites too – really powerful but perfectly balanced and versatile as a result. And the 30th Anniversary Dragon’s hybrid hardware includes PRS Phase III locking tuners and the PRS patented tremolo system. 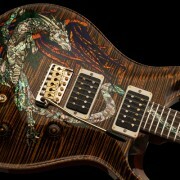 http://www.prsguitarseurope.com/wp-content/uploads/2015/01/prs_dragon_detail_web2.jpg 400 850 Kieran Morgan http://www.prsguitarseurope.com/wp-content/uploads/2014/06/340-300x137.jpg Kieran Morgan2015-01-29 10:36:392015-02-04 12:02:0230th Anniversary Private Stock Dragon Takes Flight! Mark Holcomb (Periphery) Signature Model Unleashed! One of the hottest metal acts in the world right now, Periphery’s hard-hitting blend of polyrhythms, crushing riffs and soaring lead lines takes no less than three guitarists to deliver. We’re very pleased to have one third of the trinity, Mark Holcomb, in the PRS family – and super-excited to announce the release of his new signature model! Based on the classic PRS Custom 24, Mark’s guitar has lots of artist-specified features that make it a proper fire-breathing metal monster. Flat fingerboard, Mark’s signature Seymour Duncan pickups, a new design plate-style bridge, green abalone “J” birds, black Hipshot O-ring controls and glow in the dark side dots add up to a very distinctive, characterful addition to the PRS line-up. And these features complement the guitar’s carved, figured maple “10” Top, mahogany back, 24 fret Pattern Thin neck, PRS Phase III locking tuners, and volume, tone, 5-way blade switch control layout. 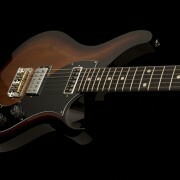 If you fancy getting your hands on one of the most aggressive PRS guitars currently available, be quick! There is no limit to the number of Mark Holcomb Custom 24s being produced, BUT the ‘order window’ for the guitar is open only until 6 March 2015. 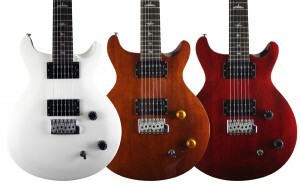 So be sure to get your order in with your PRS dealer before this date if you don’t want to miss out..! Full specifications and a video with Mark can be found at here, and you can check out a short Q&A on his signature model, advice for aspiring musicians, and more here! 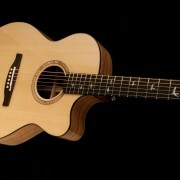 http://www.prsguitarseurope.com/wp-content/uploads/2015/01/markholcomb_angle_WEBheader.jpg 531 800 Kieran Morgan http://www.prsguitarseurope.com/wp-content/uploads/2014/06/340-300x137.jpg Kieran Morgan2015-01-13 15:18:362015-01-13 15:18:48Mark Holcomb (Periphery) Signature Model Unleashed!